Home » Get David’s Books! Click on the book titles for a link to Amazon.com. 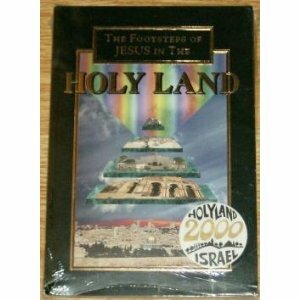 The earliest Christian communities engaged in bold and imaginative re-readings of their Scriptures―none more astounding and potentially inflammatory than of the passages that focus upon the name and nature of Israel’s God. In this volume, David B. Capes tracks the Apostle Paul’s use of Old Testament texts that directly invoke God’s name, Yahweh, for what they can disclose about the earliest Christian beliefs and practices. God invites us to judge and to help correct wrongs from a place of understanding. Sometimes we pre-judge a person based on our own biases and superficial experiences. We stifle dialog before the conversation even begins. If all we know is our own faith, and we never put it side-by-side with what others believe, our spiritual growth and commitments can be easily stunted. By truly listening and learning from those with different beliefs, we can broaden and deepen our kingdom commitments. Step into the story behind “the story.” Discover the reasons behind and the vision for The Voice translation! In-depth interviews with key participants explain the translators’ motivations and visions for the project. Learn how the translators worked to bring a balance between scholarship, literary style, and forward thinking to meet the scripture needs for the church. Readers will be inspired to praise and will find comfort, wisdom, and help for daily living through The Voice of Psalms. This is maybe the most helpful rendering of Romans in the English language: at times as beautiful as a songbird in early spring; at times earthy and raw like our human frailty, but always honest.In a time when our society seems to be struggling and grasping for hope . . . This retelling of the Book of Hebrews is designed to help postmodern readers understand how Jesus completes the law and prophets. David Capes has written a compelling comparison of the unusual character from Genesis, Melchizedek, and the Liberator found in the New Testament, Jesus. His story is followed by the complete text of Hebrews retold by Greg Garrett. This is the first time the Book of Hebrews has been examined from a postmodern perspective. This delightfully multifaceted volume, comprised of thoughtful essays by an esteemed array of cultural critics, probes the intersection of Christian faith and culture to honor the memory of A. J. “Chip” Conyers, a remarkably ecumenical Christian scholar and cultural “warrior” whose premature death in 2004 cut short a remarkable career in teaching and writing. As those who knew him can attest, Conyers lived his life at the intersection of Christian theology and cultural concern with a singular blend of astuteness, gracefulness, and Christian conviction. 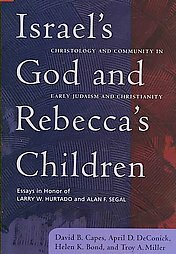 Israel’s God and Rebecca’s Children is a collection of essays written as a tribute to the lasting scholarship and friendship of Larry Hurtado (University of Edinburgh) and Alan Segal (Barnard College), two scholars who have contributed significantly to the contemporary understanding of Second Temple and Rabbinic Judaism and early Christianity. Their colleagues and friends examine a wide range of topics that have been the focus of Hurtado and Segal’s research, including Christology, community, Jewish-Christian relations, soteriology and the development of early Christianity. Together these essays reconceptualize Christology and community in Judaism and Christianity and provide valuable insights into the issues of community and identity. A beautiful retelling of the last week in the life of Jesus Christ (from John 13-21), including 17 dramatic illustrations by Rob Pepper. This unique work captures the urgency of the last living disciple telling his students about the most significant event in history. It includes first person commentary told in John’s voice with comments from Matthew, Mark, and Luke. The compelling story gives the reader the sense of being around a campfire with first century believers, hearing the story directly from John. So come into the story, smell the mixture of the salty air and billows of smoke floating from the bonfire and hear the Last Eyewitness. “YHWH Texts and Monotheism in Paul’s Christology,” Early Jewish and Christian Monotheism, ed. Loren T. Stuckenbruck and Wendy E. S. North (JSNTS 263/ London: T. & T. Clark International, 2004), 120-137. “The Lord’s Table: Divine or Human Remembrance?” Perspectives in Religious Studies 30.2 (2003), 199-209. “Imitatio Christi and the Gospel Genre,” Bulletin for Biblical Research 13.1 (2003), 1-19. “The Eighth Day,” Christian Reflection: A Series in Faith and Ethics (July 2002), 17-24. “Tongues Speaking in the Early Church,” Biblical Illustrator (Spring 2000), 45-48. “Imitatio Christi and the Early Worship of Jesus” The Jewish Roots of Christological Monotheism: Papers from the St. Andrews Conference on the Historical Origins of the Worship of Jesus, ed. Carey C. Newman, James R. Davila, and Gladys S. Lewis (Leiden: E. J. Brill; JSJsupp: 1999), 293-307. “Intertextuality in the Matthean Baptismal Narrative” Bulletin for Biblical Research Volume 9 (1999) 37-49. “Hours in a Day” Biblical Illustrator (Fall 1998), 36-38. “Preexistence,” Dictionary of the Later New Testament and Its Developments. Edited by Ralph Martin and Peter Davids (Downers Grove, IL: InterVarsity Press, 1997), 955-961. “Interpreting Ephesians 1-3: `God’s People in the Mystery of His Will'” The Southwestern Journal of Theology (Fall 1996), 20-31. “Yahweh and His Messiah: Pauline Exegesis and the Divine Christ” Horizons in Biblical Theology 16.2 (December 1994), 121-143.
Review of Pauline Theology: Ministry and Society by E. Earle Ellis (Eerdmans, 1989) Journal of the Evangelical Theological Society 35.4 (1992), 541-542.
Review of Philippians by F. F. Bruce (NIBC: Hendrickson, 1989) Journal of the Evangelical Theological Society 35.4 (1992), 540-541.